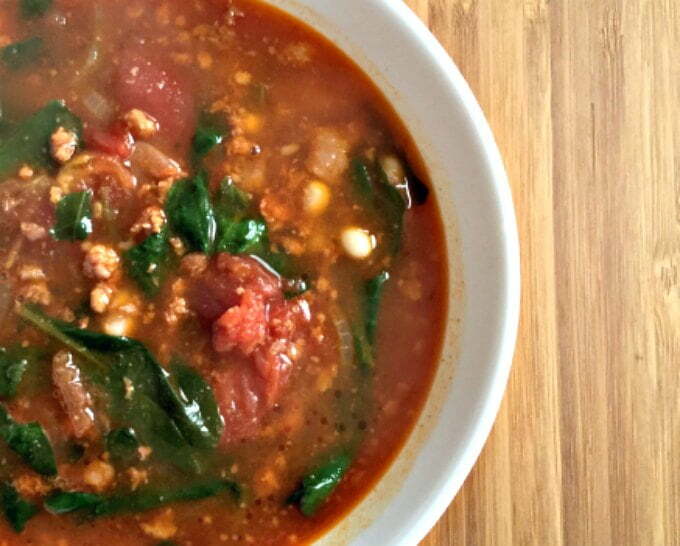 2 Dishes from 1: Turn Beans & Greens into a Spicy Chorizo, Kale & Bean Soup in just minutes! I found two cool items at Aldi the other day. 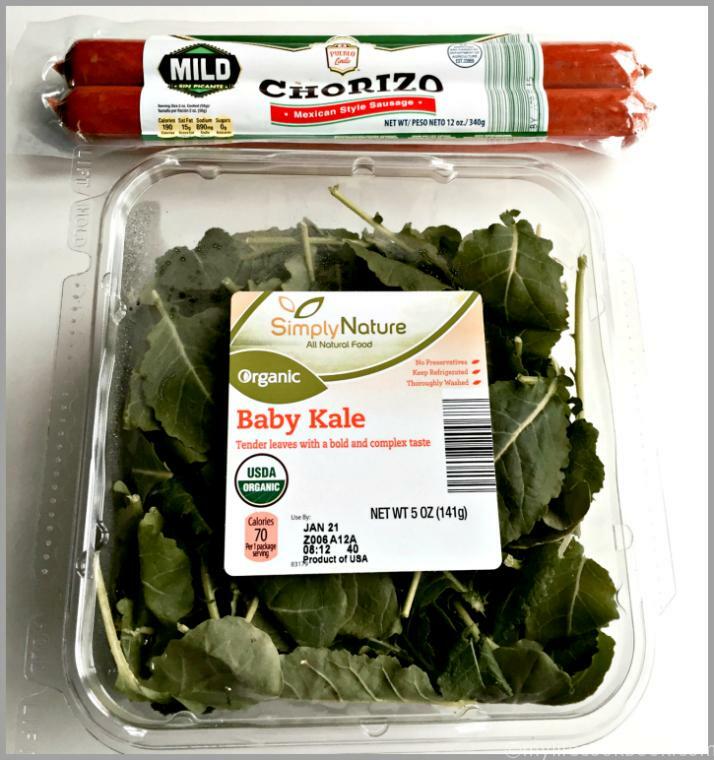 Organic baby kale and chorizo. They always have the organic baby kale as well as arugula and baby spinach so that wasn’t special but the chorizo was. 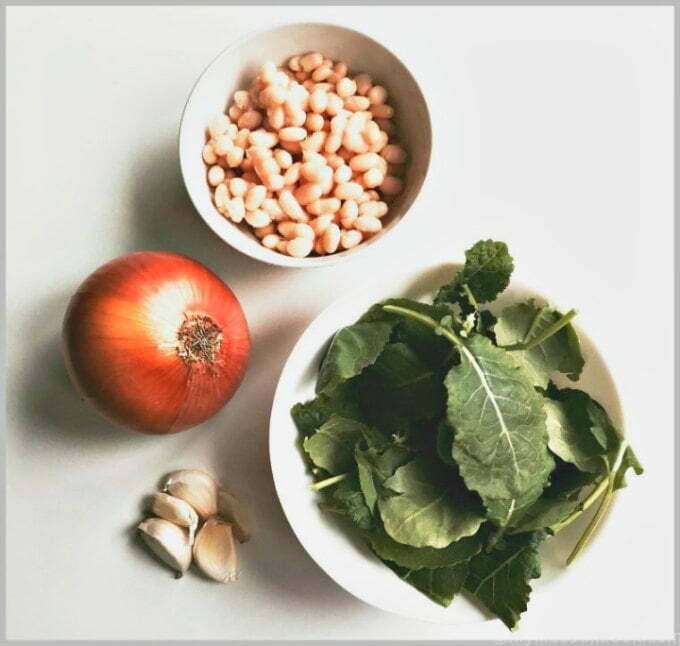 Torn as to whether I wanted to make beans and greens with the kale or use it in a soup with the chorizo, I finally decided to do both. First I made the beans and greens, split the batch in half and used it in the soup with the chorizo. Two dishes in one! 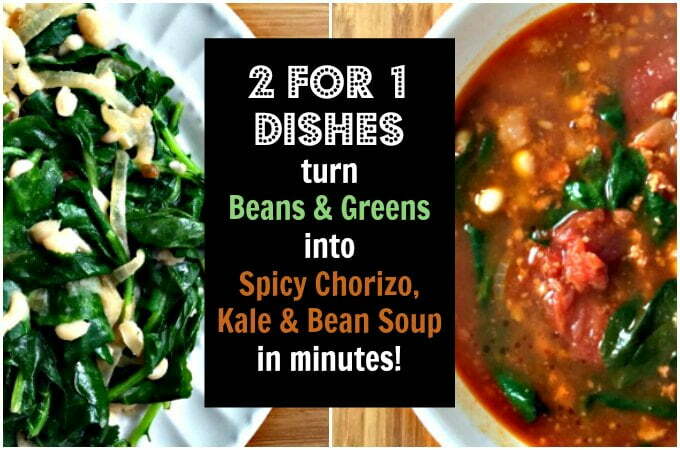 So you can have beans and greens on Monday and spicy chorizo, kale & bean soup on Tuesday! I really just wing it when it comes to beans and greens. To me it doesn’t take exact measurements but I’ll try my best. Usually it’s just beans, greens, olive oil and garlic. However I was in the mood to have caramelized onions in mine so first I added some olive oil to a pan and browned my onions. This takes awhile but now you are almost done. Next you add the garlic and beans and cook for a few minutes until the garlic is fragrant. I had some frozen beans that I had soaked and cooked previously but canned beans are just fine. Then you add your greens and some chicken broth and let them cook down. I don’t like mine cooked too much so mine are more wilted. If you like yours more cooked, just keep add chicken broth and let them cook longer. Note the baby kale takes only a few minutes to cook. However if you are using the bigger, tougher leaves, it may take longer. And now you have some beans and greens. On to the soup. 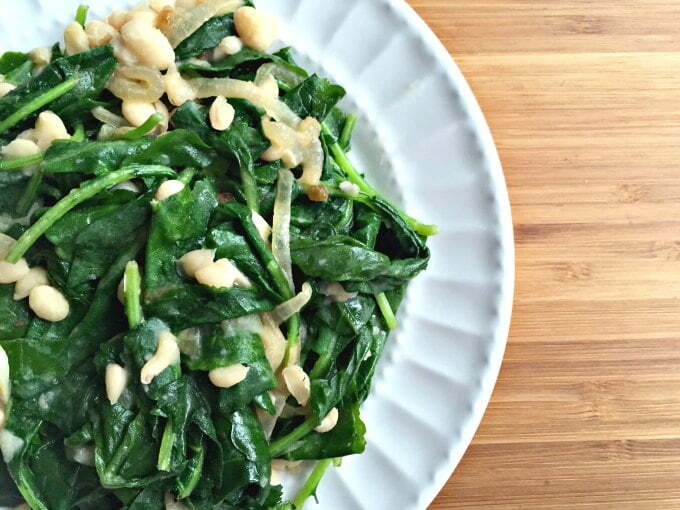 Take half of the beans and greens and eat them as a side dish for dinner or as your lunch. Then take the other half and set aside to put in our soup. This part is very quick and easy. Brown your chorizo in a soup pan. This particular kind that I got from Aldi had a plastic casing that I had to cut off and squeeze the chorizo out of…kind of like ground sausage. The chorizo I’ve used in the past had regular casing and I would just chop it up and brown it in a pan. Doesn’t matter either way it will still taste great. Once the chorizo is browned, add your stewed tomatoes and cook for a few minutes so the tomatoes will break up and meld with the chorizo. Then add the beans and greens and chicken broth. Let this cook for about 10 minutes. Season with salt and pepper. That is all there is to it. 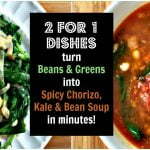 You now have two dishes from your beans and greens by just add a few extra ingredients. The soup is really tasty and while I think the chorizo is perfect here, you could always use another type of sausage if you like. I hope you enjoy it as much as my family did. Add the onions and olive oil to a sauté pan. Cook the onions well until they are brown and caramelized. Divide the mixture in two for your soup and a separate side dish. In a soup pan add your chorizo and brown. Add the can of stewed tomatoes and break up the meat and tomatoes with a wooden spoon or a potato masher. Cook mixture for 5 minutes or so until the tomatoes have softened and the meat is cooked. Add the greens and beans and chicken broth. We wind up with so much kale in our produce box and I LOVE chorizo – I can’t wait to try this! Thanks so much for linking up to Awesome Life Friday – we’re looking forward to seeing what you have to share this week! They both look delicious! Thanks for sharing with Tasty Tuesdays. Yum! Thank-you for linking up to bloggers brags pinterest party. I have pinned this post to our board! Oh! that soup sounds mighty delicious! Thanks for sharing, visiting from Teach Me Tuesday!